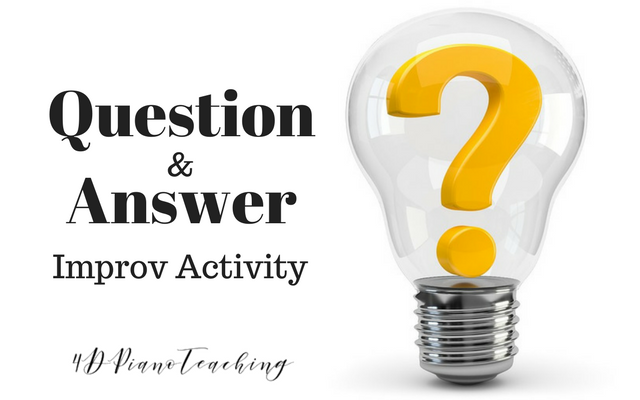 Today I am sharing an awesome improv idea for you to use at your next lesson. This activity reinforces question and answer phrases in an easy, fun way for students. 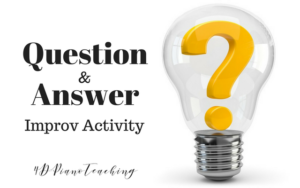 I like to start lessons with improv to loosen students up and get them making music right away. First, pick a key – any key! Usually we use whatever scale, tetrachord, or 5 finger pattern they’ve been practicing this week. Once we’ve set the position, I make up a 4 measure melody ending away from the tonic. Sometimes I like to add words since it helps the younger students who like to sing along. Be creative and do whatever your student will respond to best! I’ve created a simple printable with a few examples to get you started! These have teacher accompaniments added but they are just simple chords so you can continue the LH as your student replies to your question. As students advance, we practice different types of answers (parallel and contrasting). It’s great to take these concepts out of the method books for more reinforcement. Also try to encourage your students to start composing with some of the questions & answers they create too!